Kira calls for her mother, but there is no reply. Her mother passed away due to illness four days ago, and her father was killed by beasts before her birth, so now she is an orphan. Kira, the main character, is still very young, and has a twisted leg that makes it very hard to survive in this future world. If it weren’t for her special skill of weaving, she would have been left to die. The Council of Guardians recognized her, and offered her a home and a job. Every year, there is the Gathering, where all the residents meet together and the singer sings the ruin song. This song tells the story of their ancestors, and how the world was destroyed because of them. During the song, the singer wears a robe that shows the ruin of the world. Kira’s task was to fix the tears in the robe, and eventually add the future to the empty spot. She moved into a room next to a boy her age named Thomas, and with their younger friend Matt they found that maybe not everything they were being told was true. The Council of Guardians has everyone believe that there are beasts living in the woods, and people have to stay in the city to be safe. The more Kira learns, the less she believes her city. 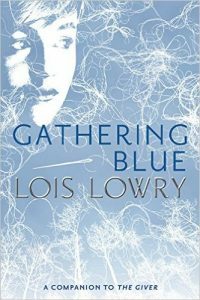 Lois Lowry’s Gathering Blue is the second in the popular Giver series, and was exciting right from the start. The characters and plot in this dystopian novel were believable and the ending was very surprising. It was narrated in third person limited, meaning the narrator could see into the mind of one character, Kira. I would recommend Gathering Blue for teenagers and young adults who love science fiction and suspense.